It takes roughly two weeks to adjust to a new climate, about the length of time of a vacation, just when you start to relax, you leave. 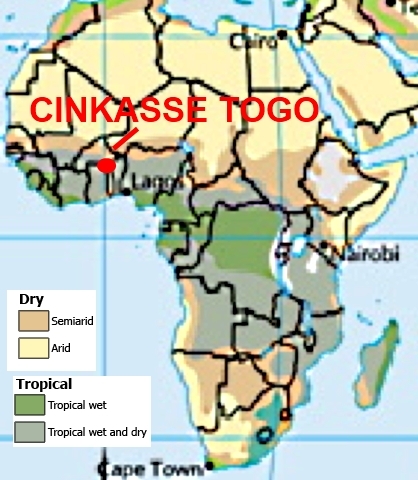 Climate Map of my present location in Cinkasse, Togo, West Africa. Weather is a short term, a localized situation that last less than two weeks. Climate encompasses temperature, humidity, atmospheric pressure, wind, rainfall, and atmospheric particle count. There are a number of nearly constant variables that determine climate, including latitude, altitude, proportion of land to water, and proximity to oceans and mountains. We at HoboTraveler.com have been collecting the latitude and longitude, and altitude of each of my locations. This data is specialized in nature, and allows astute readers to better access a destination. If you reviewed your world travels, you maybe be able to remember the times when you was happy and comfortable. Then if you discovered the climate conditions, with special care to know the altitude you could find similar locations for you next vacation. I enjoy tropical locations that are about 1500 meters above sea level. The first two weeks of a trip can be enjoyable; you do not need to sit around pretending to be happy, you can actually be happy. However, to truly enjoy travel, there is a wonderful bubble of time between two weeks and 12 weeks when a location is great. I call this "Social Norms Purgatory." I am in an area that is 95-98 percent Islamic, I would say the social climate is like living with a preacher, sort of always the preachers kid.